There are now 99 separate walls in Belfast dividing working class Protestant and Catholic communities. The net cost to the economy: a £1bn a year. Some are as high as 6m and extends up to 34 Km. The largest, which cuts off the loyalist/Protestant Springmartin estate from the nationalist/Catholic Springfield Park was made of 1m bricks. When the Republic of Ireland gained independence from Great Britain in 1921, six northern counties remained under British control and became known as Northern Ireland. While the Republic of Ireland is predominantly Catholic, Protestants hold the majority in Northern Ireland. 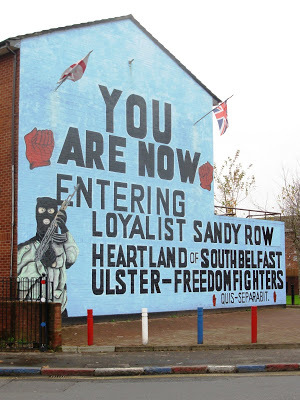 Much of Northern Ireland’s Protestant majority is unionist (or loyalist), remaining loyal to Britain and rejecting the notion of one Ireland under Catholic-majority rule. Many Catholics in Northern Ireland are nationalists (or republicans), who seek a unified Ireland. In strife-torn cities such as Belfast, conflict simmered neighborhood by neighborhood and even block by block. In 1969, the British government built the first “peace line” in Belfast, in hopes of quelling violence between unionists and nationalists. Other barriers followed in the 1970s and 1980s, during the height of The Troubles. Some argue that the “Peace Line” — though not continuous, the barriers are collectively known as a single entity — is nothing of the sort; it divides communities and sows conflict. Others argue that the Peace Line has served its purpose in limiting sectarian strife, and also note that it has evolved into a part of the urban landscape; many barriers have been transformed from ugly and imposing gray steel or barbed-wire fences to aesthetically pleasing brick walls surrounded by trees and shrubs. The barriers are popular with residents. When polled, the people of Belfast usually oppose tearing down existing walls. They feel protected and comfortable in their mighty shadow. “They’re afraid they’ll be vulnerable if things spin out of control,” Jarman explains. This is especially true around July 12th every year when the Protestant Orange marching season begins.